If your website is not on the first page of search engine result pages (SERPs), it’s highly likely your target audience doesn’t know you exist. According to Google, over 50% of website owners are not leveraging the potential of the online market yet they have invested in building business websites. Without a fully functional website, your business is as good as dead. In fact, over 77% of shoppers are now using the internet to make their shopping decisions. This is the reason your website should be optimized for search engines. This ensures your pages are highly ranking for your targeted keywords on SERPs. If you are struggling to break into the online market, it is time to try search engine optimization (SEO). While it might sound like something you can do, it is important to appreciate the technical nature of an SEO project. This is a specialized field, which should only be handled by an expert. There are so many experts in the field and it is important to hire the best. An experienced SEO is best positioned to help your SEO strategy. The longer a professional has been in the field the better. Such an expert understands all the trends in the industry and helps you make an informed choice. More importantly, they understand Google algorithms to avoid techniques that to penalties. 2. How do you improve a site’s Ranking? SEO strategies are supposed to be transparent and this is one reason you sign a contract with the firm working on your website. If an SEO strategist doesn’t want to elaborate the techniques being used, it is highly likely they are using black hat techniques that could lead to penalties from Google. If there are any guarantees offered by your SEO expert, you better run and never look back. You need to appreciate the technical aspect of SEO and the fact that no one can assure you of a top ranking. Google algorithms are difficult to understand and the only thing your SEO can do is to audit your site and ensure it fully conforms to webmaster guidelines. The best SEO should promise to work on your site using white techniques to promote your ranking. 4. Do you emphasize local search results? While appearing at the top of SERPs is important, you need to focus on local search. Your website should be optimized for local search to ensure you drive traffic to your business. An SEO strategist must focus on local SEO in order to improve your conversion rates. Your business site must include the city whose audience you are targeting. Make sure your site is listed on Yahoo, Google and Bing Local listings. 5. How do you evaluate the SEO Strategy? It is important to monitor the success of an SEO strategy to determine what needs to be improved. 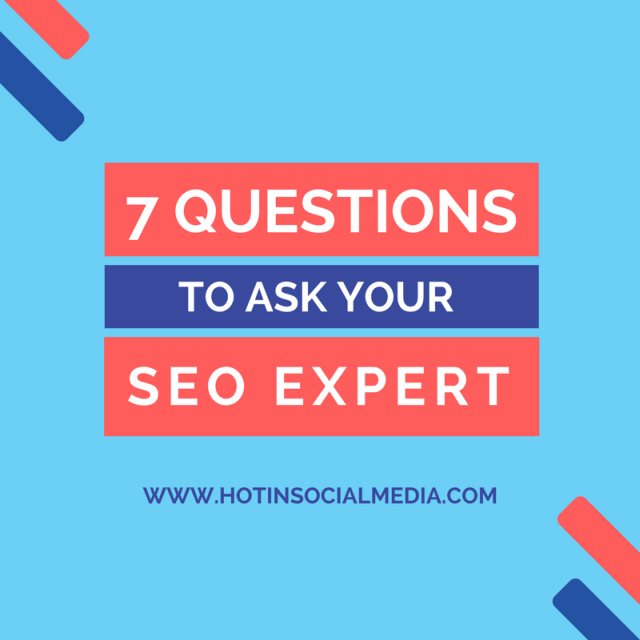 Your SEO expert should monitor the improvement of your site’s ranking on SERPs to determine whether the strategy you are using should be maintained. Using Google analytics helps assess how your site is improving in ranking for targeted keywords. 6. How do you communicate? Before hiring an SEO, ask about their communication channels. It is important to appreciate that these people will be working on your business website, which makes it important to know what they are doing at any time. Make sure there are clear guidelines on how the SEO firm will communicate. This guarantees you stay updated on the progress of the SEO project as it progresses. 7. What changes do I expect on my site? Before an SEO starts working on your site, make sure you have confirmed what changes to expect on your site. You need to appreciate this is your business website and all changes must be approved by your team. The SEO strategy should be in line with your website’s objectives. More importantly, any changes should be done in a seamless manner to ensure users are not disoriented by such changes. An SEO professional will help increase traffic to your website and boost your ranking on SERPs. Make sure you have the right professional working on your site to guarantee more conversion. See also: How to optimize your website for Google Mobile-First Index?